Did Kamala Harris' Verbal Assault On Kavanaugh Boost Her Odds Of Winning 2020 Nomination? 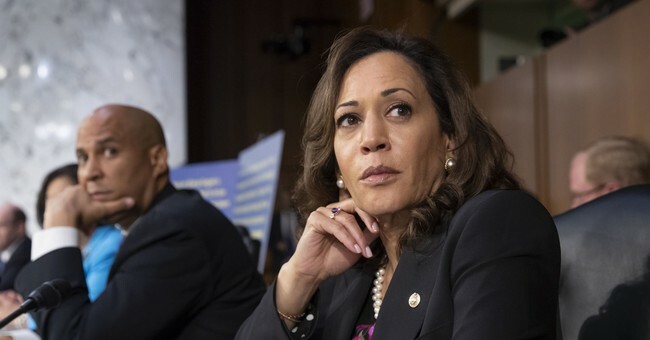 Senators Kamala Harris and Cory Booker clearly want to become President, and for them Brett Kavanaugh is merely a stepping stone on the path to the White House. The Right has been criticizing their conduct, for good reason, as openly partisan and cynical. But that’s what the right thinks. Was this stunt popular among Dems and independents, and has it boosted the Dems for Nov and Sens Harris and Booker in 2020? While Kamala Harris is the most likely person to become the Democratic nominee, she only got a very small temporary boost from her verbal assault on Kavanaugh. She started the confirmation hearings at 21% and she’s at 22% today. Note: this market is not who will win the presidency, just who will win the Democratic nomination. Her extreme self-promotion activities were not particularly popular with Democrats either. Spartacus didn’t help himself much either. Booker started at 14% to be the Dem nominee, now he’s at 15%. Republicans should hope the bettors are wrong: Booker would be much easier to defeat in 2020 than Harris. Dems have gotten a bit of a boost in the House, which was likely caused by President Obama’s reappearance as a political actor, not the Kavanaugh debacle. In the Senate, Republicans fell by 1%, which could be ascribed to the same factors. I doubt Republicans will get a boost from the Kavanaugh hearings, at least until he’s confirmed. Even then, I’m skeptical. The Republican base is more interested in culture wars than it is concrete action and results. By the way, the confirmation hearings didn’t just not help Democrats, they helped Kavanaugh. He is now at 87% to be confirmed by the end of this month.